In Fort Worth, loans from the Dresden State Art Collections offer an exhibition of brilliant detail. Thank heaven for museum renovations. Every so often, they prompt major museums to lend their best treasures instead of stashing them in storage during the work—giving many people in faraway places access to art that they would otherwise never see. So it is right now with the renowned Dresden State Art Collections, which shipped several signature paintings to the Kimbell Art Museum here for "The Lure of Dresden: Bellotto at the Court of Saxony." "Dresden from the Right Bank Of the Elbe..."
Bernardo Bellotto (1722-1780) may not be a household name, but perhaps he should be. He was the nephew of Giovanni Antonio Canal, the Venetian painter better known as Canaletto for his much-loved "view paintings," or vedute, of his hometown. Bellotto, who sometimes also called himself Canaletto, began studying with his uncle in 1735 and was admitted to the Venetian painters' guild just three years later, while still a teenager. In 1747, he accepted a call to Dresden from the Elector of Saxony, Frederick Augustus II (who was also King Augustus III of Poland). By then, Frederick Augustus II, following his father, had made Dresden into a dynamic capital of his kingdom, with grand Baroque buildings and an active cultural scene populated by artists, musicians, dramatists and scholars. He engaged Bellotto to record it all in portraits of his city and also to paint Pirna, a small town about 12 miles southeast of Dresden whose medieval castle functioned as a lookout for trade routes to Bohemia. Bellotto rose brilliantly to the occasion. He painted his Dresden panoramas—seven of which are on view here—from a distance, often from an angle. He left the top half of his canvases for sky and clouds, orchestrating various lighting, shading and atmospheric effects. And when the sun was shining, he was a master of limning dazzling reflections on water, seen in the double-image of the arched bridge in "Dresden From the Right Bank of the Elbe Below the Augustus Bridge" (c. 1751-53), to cite just one example. He rendered his churches, palaces, bridges and other landmarks perfectly and in such great detail—with the help of a camera obscura and other mechanical devices—that his paintings are helping Dresden, which was bombed to near destruction in 1945, rebuild to its prewar grandeur. But what truly distinguishes Bellotto's works is their balance, their harmony and, most of all, their life. In his very first veduta for Frederick Augustus II, "Dresden From the Right Bank of the Elbe Above the Augustus Bridge" (1747), a woman hangs her laundry not far from a little conversation taking place among a stout castrato, the court physician and a Turkish servant, while a jester looks on, a little white dog at his feet. Such narrative touches, a mix of the mundane and the magniloquent, figure in all of Bellotto's view paintings. They don't necessarily depict an actual happening at a precise moment; rather than truth, they convey verisimilitude. 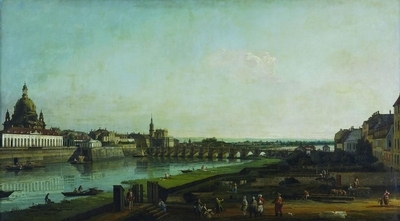 Without distracting from Saxony's glorious buildings and natural settings, Bellotto's canvases, which stretch to nearly 8 feet across, brim with these vignettes: bricklayers at work, a woman resting with her child, fishermen steering their boats on the Elbe, cowherds in their fields, sentries standing guard, the king's gilt-edged, horse-drawn carriage, a man feeding swans, and everywhere men and women in conversation, strolling the riverbank, the allée, the bridge or some other walkway. The paintings of Pirna are naturally more pastoral, but just as captivating in their detail. In "Sonnenstein Fortress Above Pirna, Seen From Hausberg" (1753-55), a shepherd and shepherdess watch their flock, a man points out something to a woman, and a liveried carriage makes its way up an inclined road to the town gate. Dresden looms in the background, off to the left. Other Pirna views depict vineyard workers, gardeners, travelers, trading carts, a woman with a water jug, a beggar and much more. 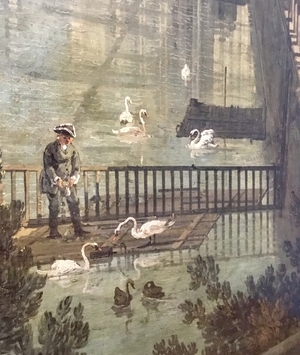 Like other view painters, Bellotto was not above repeating himself; his dogs and his strolling couples can look a little similar. No matter—he was still simply far more talented than, for example, Johann Alexander Thiele (1685-1752). 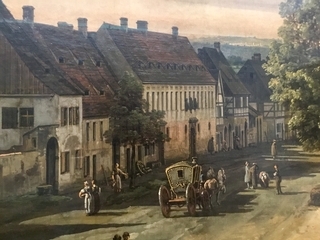 Thiele was already a court painter to Frederick Augustus II when Bellotto arrived in Dresden, and five of his view paintings are displayed here. In comparison, they are stiff affairs. Thiele's horsemen in "Caroussel Comique. Parade in the Zwinger in 1722" (before 1725), for example, resemble toys; his depictions of the Zwinger, or king's palace, look like sugary cake decorations. 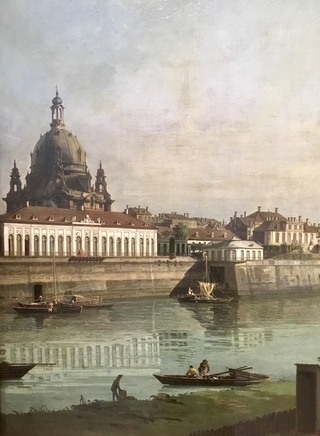 Not surprisingly, as the catalog reveals, the king promoted Bellotto to court painter the year after he arrived in Dresden, awarding him an annual salary of 1,750 thalers at a time when Thiele was given 1,000 thalers and another court painter, Christian Wilhelm Ernst Dietrich, received 400. The king also gave Bellotto a jeweled tobacco box and 300 gold French coins, rather like a signing bonus. As anyone who has eavesdropped in a museum knows, details—tiny flowers in a landscape, individual hairs in a portrait, the glint on a glass in a still life—thrill people. Bellotto's details, his vignettes of life, are not so finely executed, but I suspect that they too will draw in visitors, inspire close inspection and make "The Lure of Dresden" a crowd-pleaser—as this edifying exhibition should be.